Atrial fibrillation (AF) is the most common sustained arrhythmia seen in clinical practice. Recent data from the Framingham Heart Study have shown a lifetime risk of AF now reaching 37% in the average individual over age 55 and even higher in individuals with elevated risk factors.1 Two of the recognized risk factors include older age and obesity. With our aging population and increases in obesity, the prevalence of AF is projected to continue to increase dramatically in the future. 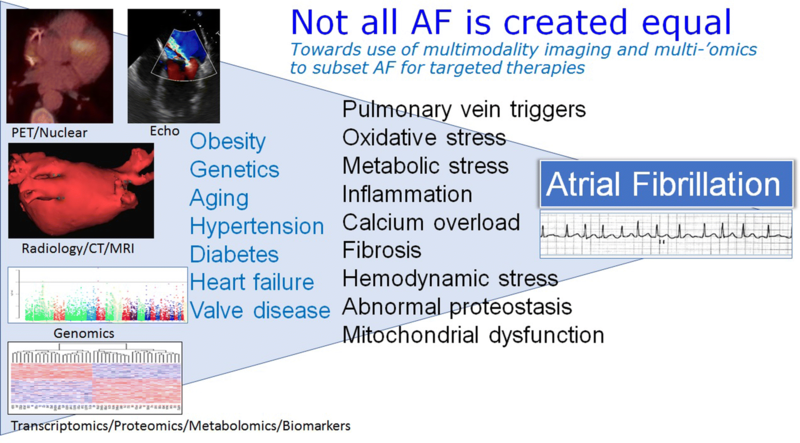 The etiology for AF is multifactorial and includes genetic, structural and local cardiac electrical and biochemical physiology, as well as potential inflammatory and metabolic factors that can influence the electrical activity of the heart. To date, cardiovascular imaging for characterization and treatment of AF has been performed primarily with anatomic techniques such as echocardiography, cardiac CT, and cardiac magnetic resonance imaging. 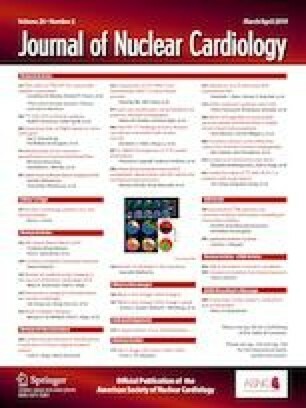 Radionuclide techniques, which are capable of assessing local cardiac physiology, have not been used extensively, but may have a role in the classification and management of AF based on our evolving understanding of the mechanisms of AF. The search for effective prevention and treatment of AF will be more successful if focused on modifiable risk factors with therapies targeting precisely characterized subsets of AF. The search for effective upstream therapies for the treatment or prevention of AF has seen dramatic changes over the past two decades. In the 1950s, Moe and Abildskov postulated an atrial substrate based theory whereby multiple random reentrant wavelets, which were more frequent in large atria, resulted in AF.2 The ground-breaking report by Haissaguerre and colleagues3 in 1998 demonstrated that triggers originating in the pulmonary veins could initiate AF. This revolutionized our concept of AF pathophysiology and led to our current explosion of ablative therapies targeting pulmonary vein isolation. In parallel to the development of these ablative approaches targeting the initiation of AF were studies focused on the atrial electrical and structural remodeling that can occur with and potentially promote the progression of AF to more persistent forms. Yet the prevention of AF progression and cure of persistent AF have remained a bane of ablation and medical therapies. Such studies provided rationale for the study of putative upstream therapies for AF that targeted inflammatory, fibrotic, calcium overload, and oxidative stress pathways using statins, steroids, ACE inhibitors, ARBs, and omega-3 fatty acids. However, while these drugs appeared to be associated with lower AF in the conditions for which they were originally developed, like coronary artery disease, heart failure, or hypertension, when studied specifically for AF in randomized trials, results were disappointing. Notable exceptions were steroids and statins for reduction of postoperative AF, a clear inflammatory subset of AF. Nevertheless, the disappointing nature of the studies in non-postoperative AF led to greater uncertainty as to whether inflammation or AF was the chicken or the egg. More recently, the study of genetics has led to perhaps the ultimate upstream approach to studying AF. Multiple large consortia have collaborated to perform genome-wide association studies (GWAS) over the past 10 years, culminating this year in over 100 loci associated with AF risk.8 The top AF locus is on chromosome 4q25, near PITX2, a gene implicated in formation of the pulmonary veins. Several top genetic loci are active early in cardiac development. However, AF generally does not develop until 5 to 7 decades later.9 Studies of human left atrial appendage tissue removed at the time of cardiac surgery have allowed us to study the adult atrial transcriptome in order to attempt to identify functional links between genetic variants10 and AF subsets11 with gene expression patterns. Such studies have identified an overwhelmed or reduced transcriptional response to cell stress, including inflammatory, oxidative, metabolic, mitochondrial, and protein handling stressors.11 We have proposed a dual risk model for the perfect storm for AF, where in patients with genetic susceptibility to pulmonary vein triggers from genes active in development, inadequate transcriptional responses to cell stress later in life predispose to AF. Identification of AF phenotypes, perhaps characterized by type of stress, may lead to targetable therapies in subsets of AF. A major thrust of our group’s research is focusing on identifying subsets of AF through a multi-omics approach. The current study in this journal potentially introduces PET/CT F-18 FDG imaging of atria and surrounding epicardial fat that may be particularly relevant to the process of identifying patients with particular AF phenotype subsets that might be studied for targeted therapies.12 This was a retrospective study in patients with whole body PET/CT scans presumably for known or suspected cancer that over a 7-year period identified 48 patients with AF. This cohort included a relatively small number of patients, and the AF itself was not well characterized and ranged in duration from 1 to 66 months. Nevertheless, these patients were compared to 22 patients that were “normal,” i.e., no AF. In the AF group, 32 had persistent AF and 16 paroxysmal. Interestingly, 17 AF patients were found to have increased atrial FDG uptake, all with persistent AF. Given the small numbers and the suboptimal characterization of AF these results are not definitive, but are suggestive that this technique may have a role in identifying subsets of AF patients where inflammation may play a role. Other limitations include the need to use CT attenuation maps to localize the atrial structures due to the low counts and the relatively poor spatial resolution of PET and variability introduced by the relatively high F-18 FDG counts in the adjacent left ventricular myocardium, which is variably suppressed and capable of influencing the measured SUVmax values. While a recent study has implicated inflammation via inflammasome signaling as being potentially causative for AF,13 caution should also be exercised in implicating imaged inflammation by FDG uptake as causative for persistent AF. The persistence of the arrhythmia itself can set up a vicious circle of atrial remodeling by mechanisms and pathways discussed above. Moreover, FDG uptake is not specific for an inflammatory process, but indicates uptake by highly metabolically active cells,14 as might be the case during the high stimulation rates seen in the atria during AF. In the subset of patients who had CRP levels, there was no correlation with FDG uptake by SUVmax, although it is not clear whether CRP or ultrasensitive CRP assays were used. These issues could be addressed by enrolling a larger number of AF patients with better characterization of the duration of and comorbid conditions associated with AF. Epicardial adipose has been in itself associated with AF in several studies,15 as well as AF recurrence after ablation.16 Adipose tissue is known to be highly metabolically active and to secrete proinflammatory adipokines.17 Increased FDG uptake in epicardial adipose tissue was observed in this study and may turn out to be as important to stratifying AF patients with high inflammatory or metabolic burden as uptake in atrial tissue. The distribution of increased uptake that seemed more prevalent in the right atrium in 82% of the AF patients has been previously described in patients scanned with FDG for cancer.18 It is uncertain whether this might reflect an artifact of the target-to-background ratio (TBR) or SUVmax calculations with different thresholds for left vs right atria. Or as suggested by the authors this could reflect higher fibrosis burden in the left atria. In contrast, when atrial appendages showed FDG uptake in the current study, right and left atria were equally affected and may reflect the high metabolic activity of these sub-organs. Atrial appendages are also known to produce high amounts of atrial natriuretic peptide (ANP), a protein which has co-localized with atrial amyloid protein deposits and which might provoke an inflammatory response.19 Another related explanation could be that the differential uptake reflects differential metabolic effects in the atria. As noted above, our genomics studies in left atrial appendage implicated a reduction in transcriptomic responses to metabolic stress. The left atria, where AF drivers or triggers may be more prevalent, could be more susceptible than the right atria to metabolic stress in AF. A potential implication is that left to right atrial mis-match could indicate a subset of AF patients in whom metabolic interventions could be tested. Clarification of these issues requires enrollment of a larger number of patients to have adequate statistical power. The potential future implications of being able to image inflammatory or metabolic stress in the atria or surrounding epicardial fat have potential implications for managing AF. Imaging modalities have been limited by the thinness of the atria walls, but an ability to image by PET/CT could represent a new paradigm in stratifying AF patients toward targeted therapies (Figure 1). We are not far from identifying new metabolic or anti-inflammatory therapies. For example, the involvement of inflammasome activation leading to IL-1β activation in AF opens the door to potentially using canakinumab, the drug tested in the CANTOS trial that blocks interaction of activated IL-1 β with IL-1 receptors, reducing CRP levels, and cardiovascular events.20,21 We await subanalyses of AF effect, but an imaging modality that could detect inflammation could provide a more specific subset of patients with higher yield from not only canakinumab but other novel anti-inflammatory therapies. Interventions targeting the metabolic aspects of AF are being tested in a clinical trial Upstream Targeting for the Prevention of AF: Targeting Risk Interventions and Metformin for Atrial Fibrillation (TRIM-AF) [clinicaltrials.gov NCT03603912]. Future clarification of imaging criteria for calling elevated FDG uptake and prospective studies will be critical to adoption of PET FDG/CT for atrial imaging and use in targeting therapies. The use of novel radiotracers that can distinguish metabolic vs. inflammatory tissue has been a long-awaited goal of PET imaging and will be highly applicable to imaging in patients with AF. However, we commend the authors for taking this first important step in opening a new window for potentially meaningful imaging of the atria. The authors declare that they have no conflict of interest to disclose.